They said cupcakes were a craze, but with so many successful cupcake stores around Sydney it seems they may have been wrong. 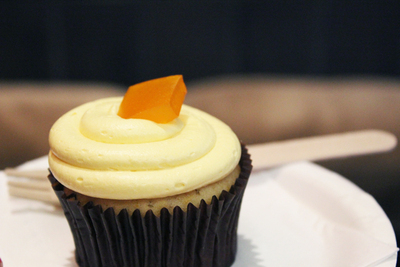 Ghermez Cupcakes have four stores in and around Sydney, and their Sydney CBD store is the perfect little spot to escape into cupcake heaven. You'll find the small store on George Street, a short walk from both Pitt Street Mall and Circular Quay. Immediately you're faced with the choice, as rows of the many flavoured cupcakes are laid out before you. Of course there are the familiar flavours like vanilla, banana, red velvet, chocolate, and carrot, but there are some other interesting flavours like mango trio and dulce de leche. You can also see the Turkish influence in flavours like pistachio & rose, and rose chocolate. You can check out the full list of flavours online. 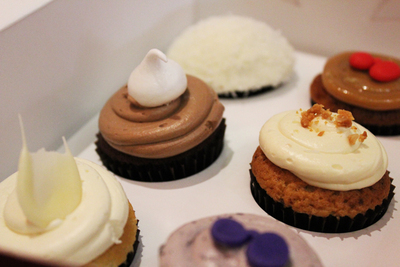 The cupcakes at Ghermez are light and fluffy, and incredibly moist. 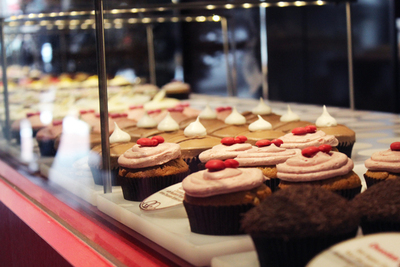 Everything that you want to find in a good cupcake. Their cupcakes use fresh ingredients, real fruit, and are finished with simple but stylish toppings. You can take a seat at the back of the store if you'd prefer to sit down to enjoy some cupcakes, or you can grab either single, 6-pack, or 12-pack boxes to take home and enjoy later. They're best eaten fresh, so don't keep them at home for too long before eating them, although you probably won't be able to help yourself anyway. If there's one downside it's that the seating at the rear of the store feels like it's better designed for a quick indulgence rather than a long chat over cupcakes and coffee. If you can't make it into the George Street store then you can order online, over the phone, or by email instead. Just head to the website and choose your preferred ordering method. Other Ghermez locations are in Bondi Junction, Alexandria, and Chatswood.